The 1970s brought us "two divorced men" who were forced to share an apartment together in the sitcom The Odd Couple, and in 2013, we get to see another tale about four divorced men living in the same apartment complex in the sitcom We are Men. The series, created by Rob Greenberg (known for his work with How I Met Your Mother), stars Chris Smith as Carter Thomas, a young guy ready to marry his one and only love. Sadly, a disaster happens at the wedding and he is left at the altar, and forced to move into a short-term apartment complex where he befriends three older divorced guys who've been up and down the aisle... more than once in some cases. Chris Smith (Carter Thomas) made his television debut in a 2009 episode of the series 30 Rock. The New York native attended the Tisch School of the Arts and was also trained at the Atlantic Theater Company Acting School in New York City. He has also made appearances in series including The Office, The Mindy Project, and How I Met Your Mother. Kal Penn (Gil Bartis) became known to the entertainment industry with roles in films including National Lampoon's Van Wilder and Harold & Kumar Go to White Castle, and has had roles in series including House and How I Met Your Mother. 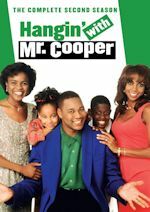 He has had guest roles in series including Spin City and Sabrina, the Teenage Witch. In addition to his roles in the entertainment industry, he has also served as Associate Director in the White House Office of Public Engagement. Jerry O'Connell (Stuart Strickland) is perhaps best known from his role in the movie Stand By Me, but he has had a long career that includes starring roles in Sliders and Crossing Jordan. Additional credits include guest roles in Charles in Charge, Ugly Betty, and Samantha Who? Tony Shaloub (Frank Russo) is known for his TV roles in successful series including Monk and Wings. Additionally, he was a member of the cast in the short-lived sitcom Stark Raving Mad. He has appeared in guest roles in Dinosaurs, The X-Files, Frasier, and Ally McBeal. Rebecca Breeds (Jill Russo) is an Australian actress relatively unknown to American audiences, but she has previously appeared as a regular in the Australian soap opera Home & Away as well as the children's drama Blue Water High. In the pilot, we begin with Carter Thomas' big day... he is about to get married. Unfortunately, he is abandoned at the altar at the most inopportune moment. With nowhere else to turn to, he ends up at a short-term rental complex filled with men who've been divorced, including Gil (Kal Penn), Stuart (Jerry O'Connell), and Frank (Tony Shalhoub). Despite the fact that they're older and have much more life experience, Carter befriends these guys and begins to see that there is life beyond a broken engagement. Well, at least for a few days, until Carter reunites with his ex-fiance and begins to make new plans for a direction back to his old path in life. He quickly seems to be slipping back into his old ways of being under the control of somebody who wants to run his life and everything that he does. And one way or the other, he has to find that right path, maybe with a little help from his friends. The series is created by Rob Greenberg, but I was very concerned when I read about the other executive producers for the series. 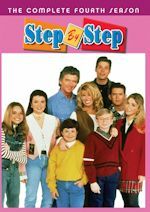 The other two happen to be Eric and Kim Tannenbaum, and while they are certainly no strangers to the world of sitcoms, some of their past history comes in the hands of series that have aired on Fox, including Running Wilde, Brothers, and Sit Down, Shut Up. In all fairness, they are also associated with Two and a Half Men, and I would hardly put that in the category as those Fox series. Fortunately, this series actually seems to be, at least based upon the first episode, pretty good. My opinion of the series seems to be in disagreement with a lot of critics who found it to be "boring," but I feel that it is something a bit different than what we've seen on TV lately. Sure, it has some elements of a romantic comedy where the guy or girl (in this case, the guy) is trying to find a guy or girl (in this case, a girl) while dealing with challenges in his life (in this case, three older friends who've found the girl... time and time again). But I also feel like this show doesn't push that over the top in the way that far too many shows do. The pilot was not really over the top funny, but of course, being funny is not the only element necessary for a sitcom. The plot of the pilot was, at least to me, an entertaining plot to watch from beginning to end. So many series that I view these days seem to have dead end plots on the pilot episode, but in watching this, I feel like there are so many potential ideas that can be tossed around. The question is, of course, how the producers will use such ideas (and since we were only able to view the pilot, we don't have that answer yet). One area of concern that I have, though, is the fact that this series does not seem to flow with the crop of CBS sitcoms as we know them. 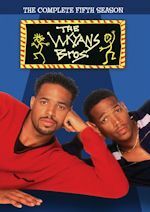 NBC and Fox started the single camera sitcom trend, and in recent years ABC has made it work very well for them as well, but CBS, while managing to have some of the best traditional sitcoms, has still yet to have one proven hit in this format. This can be particularly problematic considering that the CBS Monday night lineup is still a multi-camera lineup. It is very rare that I watch a sitcom pilot and actually enjoy it. Even shows that I love dearly, I can almost always look back at the pilot and think to myself that it wasn't very good, but I actually enjoyed this one. The series has some true potential to be a great series, but it is really on the wrong network and based upon other reviews, it isn't going over particularly well with some critics either. I'm hopeful, though, that audiences will give the show a fair shake, and that it won't go down as one of those series that we forget about before the season is said and done. Discuss the show after you watch it on Monday, September 30, 2013 at 8:30PM ET/PT on our message board. For the week of Sept. 30-Oct. 4, 2013, we have many current sitcom stars and past sitcom stars on TV talk shows! All times listed are Eastern. So get your DVRs (or whatever you use) ready! Ready? Here is all what you need to know for the coming week! Sean Hayes (Sean Saves the World/Will & Grace) - Watch Sean on The Late Show with David Letterman at 11:35pm on CBS. Danny DeVito (It's Always Sunny in Philadelphia/Taxi) - Danny appears on Jimmy Kimmel Live! at 11:35pm on ABC. Wendi McLendon-Covey (The Goldbergs/Rules of Engagement/Reno 911!) - Wendi is a guest on Jimmy Kimmel Live! at 11:35pm on ABC. Simon Helberg (The Big Bang Theory) - Simon stops by The Late Late Show with Craig Ferguson at 12:37am on CBS. Kevin Nealon (Weeds/Hiller and Diller/Champs) - Kevin visits Late Night with Jimmy Fallon at 12:37am on NBC. Demi Lovato (Sonny with a Chance) - Demi guests on Conan at 11pm on TBS. J.B. Smoove (The Millers/Curb Your Enthusiasm/'Til Death) - J.B. drops by Conan at 11pm on TBS. Jason Biggs (Mad Love/Drexell's Class) - Jason guest co-hosts The View this Monday-Thursday on ABC at 11am ET/10am CT-PT. Jerry O'Connell (We Are Men/Carpoolers/My Secret Identity) - Jerry chats on LIVE! with Kelly and Michael, so check your listings. He will also be on CBS This Morning between 7-9am. 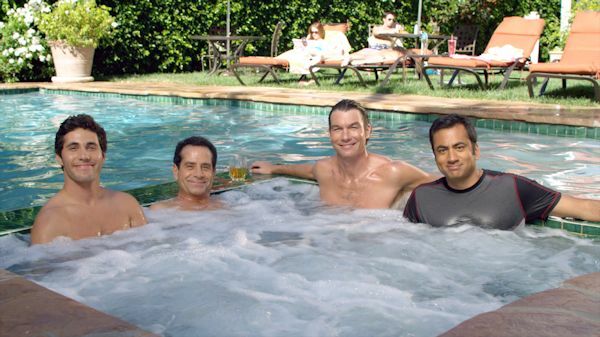 The Cast of We Are Men) - Jerry O'Connell, Tony Shalhoub, Kal Penn and Kal Penn will be guests on The Talk on CBS at 2pm ET/1pm CT-PT. NeNe Leakes (The New Normal) - NeNe joins the Chew Crew on The Chew on ABC at 1pm ET/12pm PT/CT. Tia Mowry (Instant Mom/The Game/Sister, Sister) - Tia appears on a repeat of The Better Show on the Hallmark Channel at 12pm. Reed Alexander (iCarly) - Reed shares his cookbook on a repeat of The Better Show on the Hallmark Channel at 1pm. Max Greenfield (New Girl) - Max is a guest on Arsenio, so check your local listings. Valerie Harper (Rhoda/The Mary Tyler Moore Show/Valerie's Family) - Tune in to see Valerie on The Queen Latifah Show, so check your local listings. Keke Palmer (True Jackson, VP) - Keke appears on The Queen Latifah Show, so check your local listings. Jennifer Esposito (Spin City) - Jennifer will be on Good Day New York on WNYW-Fox5 at 9:40am. Mario Lopez (Saved by the Bell) - Mario is a guest on Big Morning Buzz Live with Carrie Keegan on VH1 at 10am. Sarah Michelle Gellar (The Crazy Ones) - Catch Sarah on The Late Show with David Letterman at 11:35pm on CBS. Nick Offerman (Parks and Recreation) - Nick stops by The Late Show with David Letterman at 11:35pm on CBS. He will also be on NBC's Today in the 9am hour. Joseph Gordon-Levitt (3rd Rock from the Sun) - Joseph is a guest on The Tonight Show with Jay Leno at 11:35pm on NBC. Jay Mohr (Gary Unmarried/Action) - Jay visits The Tonight Show with Jay Leno at 11:35pm on NBC. Will Arnett (The Millers/Up All Night/Arrested Development) - Will appears on Jimmy Kimmel Live! at 11:35pm on ABC. Clark Gregg (The New Adventures of Old Christine) - Clark drops by Jimmy Kimmel Live! at 11:35pm on ABC. Patricia Heaton (The Middle/Back to You/Everybody Loves Raymond) - Patricia guests on The Late Late Show with Craig Ferguson at 12:37am on CBS. Rebel Wilson (Super Fun Night) - Tune in to see Rebel on Late Night with Jimmy Fallon at 12:37am on NBC. Mary McCormack (Welcome to the Family) - Mary is part of the guest panel on Chelsea Lately on E! at 11pm. Adam Scott (Parks and Recreation) - Adam appears on Conan at 11pm on TBS. Sheryl Lee Ralph (Instant Mom/It's a Living) - Sheryl is a guest on The Better Show, so check your local listings. The episode re-airs on Hallmark Channel on Wednesday at 12pm. Margaret Cho (All-American Girl) - Margaret chats on Arsenio, so check your local listings. She will also be on The Talk on CBS at 2pm ET/1pm CT-PT. Cedric the Entertainer (The Soul Man/The Steve Harvey Show) - Cedric appears on The Queen Latifah Show, so check your local listings. Valerie Harper (Rhoda/The Mary Tyler Moore Show/Valerie's Family) and Christina Applegate (Up All Night/Samantha Who?/Married with Children) - Valerie and Christina share their experiences with cancer on ABC's Good Morning America between 7-9am. Sean Hayes (Sean Saves the World/Will & Grace) - Sean talks about Sean Saves the World on NBC's Today between 7-9am and in the 10am hour. Kathy Griffin (Suddenly Susan) - Watch Kathy on The Tonight Show with Jay Leno at 11:35pm on NBC. Demi Lovato (Sonny with a Chance) - Demi is the musical guest on The Tonight Show with Jay Leno at 11:35pm on NBC. Tim Allen (Last Man Standing/Home Improvement) - Tim appears on Jimmy Kimmel Live! at 11:35pm on ABC. Robin Williams (The Crazy Ones/Mork & Mindy) - Robin visits The Late Late Show with Craig Ferguson at 12:37am on CBS. Marcia Gay Harden (Trophy Wife) - Marcia is a guest on Tavis Smiley on PBS, but check listings for time. Stephen Merchant (Hello Ladies) - Stephen stops by Conan at 11pm on TBS. Charles Esten (The Crew/The Brian Benben Show) - Charles chats with the ladies of The View on ABC at 11am ET/10am CT-PT. He later heats up the kitchen when he helps make a mouthwatering meal on The Chew on ABC at 1pm ET/12pm PT/CT. He will also be on New York Live at 12:30pm on WNBC-NY. Rebel Wilson (Super Fun Night) - Rebel talks about her new sitcom Super Fun Night on ABC's Good Morning America between 7-9am. She will then be on LIVE! with Kelly and Michael, so check your listings. Finally, she is a guest on Watch What Happens: Live at 11pm on Bravo. Sarah Michelle Gellar (The Crazy Ones) - Sarah appears on CBS This Morning between 7-9am. Thomas Gibson (Dharma & Greg) - Thomas visits The Talk on CBS at 2pm ET/1pm CT-PT. Tia Mowry (Instant Mom/The Game/Sister, Sister) - Tia is a guest on Bethenny, so check your local listings. J.B. Smoove (The Millers/Curb Your Enthusiasm/'Til Death) - J.B. visits Arsenio, so check your local listings. Jerry O'Connell (We Are Men/Carpoolers/My Secret Identity) - Jerry appears on Watch What Happens: Live at 11pm on Bravo. Scott Foley (The Goodwin Games/Cougar Town) - Scott is a guest on Big Morning Buzz Live with Carrie Keegan on VH1 at 10am. Billy Gardell (Mike & Molly) - Catch Billy on The Tonight Show with Jay Leno at 11:35pm on NBC. Ken Jeong (Community) - Ken appears on The Late Late Show with Craig Ferguson at 12:37am on CBS. Jerry O'Connell (We Are Men/Carpoolers/My Secret Identity) - Jerry continues to make the rounds on Conan at 11pm on TBS. Sean Hayes (Sean Saves the World/Will & Grace) - Sean is a guest on The Ellen DeGeneres Show, so check listings. Betsy Brandt (The Michael J. Fox Show) - Betsy joins forces with Mario Batali to make a delicious breakfast dish on The Chew on ABC at 1pm ET/12pm PT/CT. She will later be on Watch What Happens: Live at 11pm on Bravo. She will be a guest on New York Live at 12:30pm on WNBC-NY. Vivica A. Fox (Mr. Box Office) - Vivica appears on Arsenio, so check your local listings. Mike O'Malley (Welcome to the Family/Yes, Dear) - Mike talks about his new sitcom Welcome to the Family on NBC's Today between 7-9am. Tiffani Thiessen (Saved by the Bell) - Tiffani will be on NBC's Today between 7-9am. Zachary Levi (Less Than Pefect) - Zachary is a guest on NBC's Today in the 10am hour. Kim Coles (Living Single) - Kim appears on The Couch on WLNY-TV 10/55 in New York between 7-9am. The Cast of The Millers - Will Arnett, J.B. Smoove, Margo Martindale, Beau Bridges, Jayma Mays and Nelson Franklin are guests on The Talk on CBS at 2pm ET/1pm CT-PT. Kimberly Williams-Paisley (According to Jim) - Watch Kimberly on LIVE! with Kelly and Michael, so check your listings. She later joins Carla Hall in the kitchen to make some Mexican delicacies on The Chew on ABC at 1pm ET/12pm PT/CT. 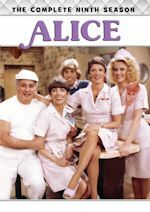 Vicki Lawrence (Mama's Family) - Vicki appears on a repeat of The Better Show on Hallmark Channel at 1pm. Mayim Bialik (The Big Bang Theory/Blossom) - Mayim is a guest on The Queen Latifah Show, so check your local listings. Adam Scott (Parks and Recreation) - Adam will be on New York Live at 12:30pm on WNBC-NY (tentative).